In 1987, as a co-op placement, I was hired by the University of Waterloo’s Engineering Education Research Center to work on a variety of projects to enhance the effectiveness of engineering education. Over thirty years later, I continue to be fully immersed in this most interesting of fields. I use the word “interesting” ambiguously. Of course it is interesting in the sense that the work we do appeals to me. But it is also interesting in the proverbial “may you live in interesting times” sense. Research in engineering education is too often a contradiction in many institutions. The word research, more often than not, applies to those familiar, hard-core technical activities where we derive one equation or another, or concoct a novel configuration of obscure theoretical concepts, to achieve some equally obscure functional goal. Research into education, however, often draws upon an interesting mix of engineering sciences and technology, and social science methodologies, and as a consequence such research tends not to be celebrated works among the core discipline-based technical societies. The ASEE Conference is an ideal showcase for inventive solutions in engineering education. Above: a stylized view of the Helicopter - Car Chase Challenge presented at the Quanser Innovation Hub. The one exception is the American Society of Engineering Education (ASEE). A large part of this venerable society’s existence focuses on the promotion and enrichment of formalized research into the improvement of engineering education. This past June, the ASEE held its annual meeting in Atlanta and drew upwards of 4000 academics to share their respective passion for engineering education. As in previous years, Quanser made a significant contribution, including our conventional display, our Innovation Hub in which we showcased the next rev of our visual hardware-in-the-loop application, and a variety of session activities that related to a range of contemporary topics in the field. In many ways, the ASEE conference is the ideal showcase for the inventor spirit within Quanser. Here, the participants genuinely relish seeing weird new ideas and putting our collective imagination to the test. And this was the intent of the Quanser Innovation Hub. Our Innovation Hub was well received and sported a new mantra that we conceived for this conference: Imagine. Think. Compute. Build. 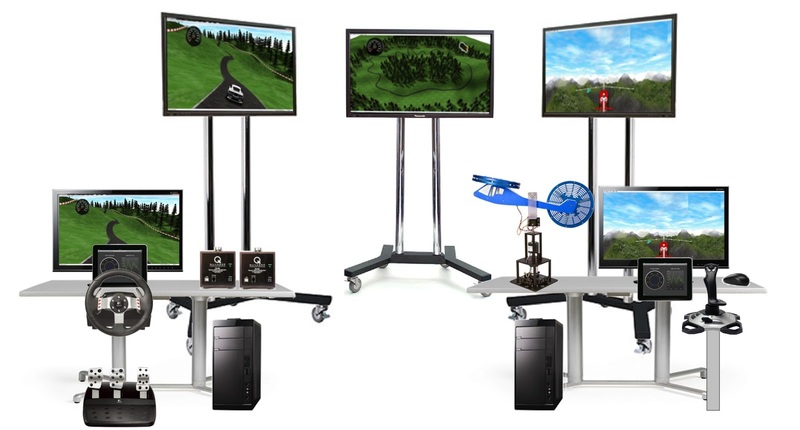 The demonstration tied a two player video game – a helicopter pilot (the chaser) and a car driver (the chasee) – with a real time control loop tied to a Quanser 2 DOF Helicopter and the new QUBE™-Servo products. Not only did we engage the audience with the richness of experience, but we also invited real students from the University of New Mexico to showcase their contributions in the development of this system. Overall, we wanted to illustrate how fun can lead to a much more rigorous and effective learning experience. Visitors to the Quanser Innovation Hub could hardly believe this helicopter - car chase challenge was actually a rigorous, control learning experience. Watch the video below to see their reaction. Another highlight was the proliferation of Quanser applications among other vendors. In addition to our two showcases, we had friends from National Instruments, Dassault Systemes, and Maplesoft among others, demonstrate unique applications of Quanser equipment married to their respective offerings. This resulted in a diversity of views and uses of Quanser devices in creative and innovative ways. Aside from the exhibits and the demonstration of the engineering education community’s technical capacity, the ASEE is also renowned for its ability to catalyze very passionate discussions and debates on education and education methodologies. For me, some of the highlights include a session that I was invited to on the topic of the “Flipped” classroom -- i.e., let students learn the basics using the many off-campus media options now available, and use valuable on-campus time for direct engagement with faculty, and group activities. This, of course is the reverse of the traditional approach at a university. It was a great opportunity for me to reflect on the greater role that hands-on labs will have in the very near future. In a flipped world, one of the best things that an educator can do is to use the on-campus time to allow students to work with real systems and real complexity and of course that’s where Quanser can make a significant contribution. I also was impressed by a particular student poster presentation by Chirag Variawa, a current Ph.D. student in Industrial Engineering at the University of Toronto. He presented his dissertation topic entitled “An Automated Approach for Finding Course-specific Vocabulary”. His research essentially developed an algorithmic way of identifying and managing a proper lexical and semantic foundation for the highly specialized courses, – in human-understandable terms, find a better way to establish a common language to communicate complex engineering concepts. As much as I like very multidimensional, richly layered approaches to education, a robust and consistent vocabulary is one of those things that seems to make all the difference in any complex, human-to-human endeavor, but is sometimes disregarded in pedagogical circles as somewhat pedantic and inelegant. I was delighted to see this young man transform the pedantic into a genuinely interesting project. Flashing back to the late 80’s, the ASEE annual conference was also the very first time that a company (the legendary DEC in this instance) paid me to stand at a booth and demonstrate interesting things. That experience was the first time that I was able to connect the dots between my life as a student, to my emerging life as a researcher, and a foreshadow of my life as a citizen and professional. Yes, the optimal design of C2 continuous parametric surfaces may look great on an academic CV (this was my dissertation topic by the way), but applying the same level of intellectual vigor on a topic that one is really passionate about, that is important to a broad cross-section of society, and often triggers activities that are genuinely fun, is ultimately, for me, the best research. I am very glad that the ASEE continues to support and celebrate such activities. To learn more about Quanser's Innovation Hub presentation, click below. I am also researcher.. nice article.